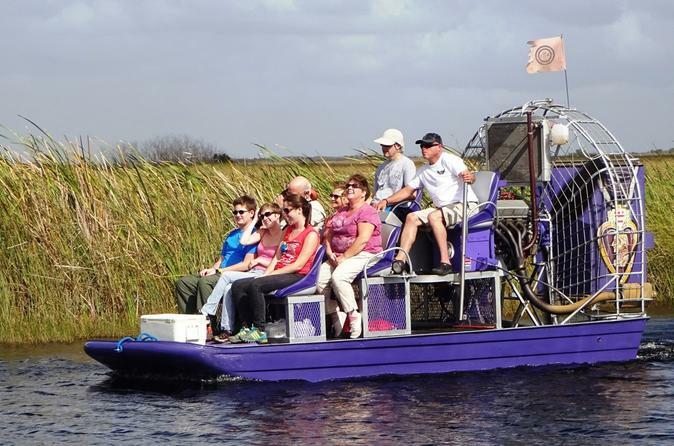 You'll feel like you’re flying through the grass on this small group airboat ride of the Everglades. If you're on a budget and looking for something "not so touristy" to do, then this is the best way to explore the "River of Grass" without causing severe damage to the eco-system. The Florida Everglades is undisturbed nature that dates back 15,000+ years. The Everglades vastly preserved eco-systemis over a million acres that is made up of grasslands and hardwood hammocks. This smooth sliding ride will be the highlight of your trip as your guide points out all the highlights of the sawgrass prairies. You will see beautiful flowers, trees and animal life found no where else in the world. Just outside of Miami lies an uncultivated home of the cold sharp toothed Florida Alligator, which welcomes everyone to their home. We may even run into an invasive specie like the Ball Python that is polluting our environment. So step out of the sand and concrete of Miami and let’s ride and slide in the River of Grass together.